Dr. 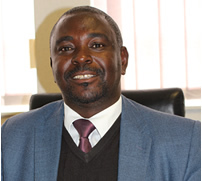 Spirit B. Tlali has been Dean of the Faculty of Science and Technology at the National University of Lesotho (NUL) since 2007. He has also served the University in different administrative capacities as the Head of Department of Physics & Electronics, the Deputy Dean and now Dean of the Faculty since 1997. He has acted in several senior management positions within the University, namely Acting Pro-Vice Chancellor, Acting Registrar and Acting Director of Planning and Development. He was a member of the 10th Council and he continued to be a member of the 11th Council which is the supreme governing body of the University. Dr. Tlali has a PhD in experimental condensed matter physics from the University of Cincinnati (USA). His research interest has been in characterization of semiconductor materials and devices using light scattering techniques. He has co-authored journal articles in this area and presented papers in several academic fora. Currently he is involved in both theoretical and experimental research in renewable energy, particularly solar energy. As an academic member of the Department of Physics and Electronics, Dr. Tlali has taught a wide spectrum of courses ranging from General Physics to advanced courses in Physics. He is also involved in community development initiatives at different levels in Lesotho.